Our aim is to add value for our customers by consulting with them to help them get the maximum possible benefit from the products we sell. It’s a win-win. Helping our customers find more success means they are more likely to tell their friends about us and trust us with their future business. If it’s the right thing to do in order to help a customer, we will sometimes recommend spending less. That’s why we call it “right-selling” instead of the typical “upselling”. It comes from putting our customers’ needs first and valuing the long-term relationship more than any given transaction. Interviewer:	We were talking about the perception of value from the customer's perspective. Part of what customers like is the expert consulting and the all-encompassing one-stop-shop. What can you share about that? Jeremy Ross:	A customer had an opportunity to research best practices with one of the downtown marketing firms. He said that he was running into up front consultation fees to even discuss his project. It just seemed to be onerous. It seemed to be more than he was really willing to expend on this project, not even knowing if he wanted to do the project to begin with or how he wanted to do it. After having worked with us, he was very open in saying that one of the huge benefits in using us was our ability to provide marketing services. We are not a marketing firm but with our decades and decades of experience, we come with a perspective of, "These are things that have not worked for people. These are things that have worked for people. These are things that you might think about. These are things that you might ask other people or go and see some of your competitors and find out what they're doing." We have learned some quick and easy fixes! It gave him every reason to use us for all of the other parts of his job. He realized the enormous value that he was getting out of using a firm that's not only interested in selling you a product but making sure that your product is going to be used most effectively. If you find success in your product, you can tell your friends about us and come to buy more products from us. Interviewer:	That is a great customer-centric philosophy, and I remember you calling it right-selling versus up-selling: you gave me some examples of how you have advised people to spend less when it's in their best interest. Jeremy Ross:	Yes, I have been accused of taking money out of my own pocket and giving it back to the customer, but I do not necessarily know any other way. I am always going towards the best you can get for the best possible value. Sometimes the best possible value means not having to spend for either all the bells and whistles or the quantity of product that a customer might use. For example, if somebody says, "Well, a thousand business cards is only $10 more than 500 business cards." My experience is, for most people in their businesses, it could take somebody five years to go through a thousand business cards. How likely is it going to happen that you are not going to have any change on your business card in five years? So, I tell the customer, "It is only $10 more, but save your $10. Spend it on something else or keep it.” If it takes you two years to go through 500 business cards, you are not going to throw away business cards if you're going to make a change or you would like a different image. Whatever the case is they see a value in, "If I buy more, it is going to be better;" but if you do not use it, then it is not better. It's wasted dollars. There is that part of that. Do you want to spend more on a portion of a job that you're recognizing value in? Your end user, the person who is going to receive the product from you, may not necessarily need a post card that big or need that many pages in your booklet because you are adding pages for a couple of neat graphics. It could be considerably less expensive to take out four pages and resize your graphics down. We try to consult, right-sell, not only the right product for the customer's needs, but also the best way to make that product so the customer is saving the most amount of money. I want to be known as the person who provided the most value, not sold the most in product. Interviewer:	That is really looking at things from the customer's point of view at a level that most people don't do. What drives this? What is the overriding philosophy that makes you ask the kinds of questions to find out what somebody is really trying to accomplish and then advise them? Jeremy Ross:	At the end of the day, or the end of the lifespan of the project, does the customer have the best feeling about how that project went? You want them to say, "What a great experience! They stopped me from making mistakes. They made my project look better than I thought it was going to look. They saved me money because they were able to consult on better materials; to use a standard color instead of a close, more expensive color; to use this paper as opposed to that paper, because it is a better buy to size the piece slightly differently. They were a consultant as opposed to just taking an order. I thought I knew what I wanted, but they took what they thought I knew and turned it into what I really needed." Which at the end of the day, that person is going to say, "I will never use anybody else, and I will tell all my friends to use that person." That is what we are really looking for: to develop the long-term relationship as opposed to just to get the sale. Interviewer:	So, you value the long-term relationship with the customer and seeing that they have a fantastic experience from their point of view, that they got the most bang for the buck they possibly could? Jeremy Ross:	Charleston is a small town and reputation is critical. If you are known for being the best for all of the right reasons: being the nicest people to deal with, offering the highest level of value, providing super quality and service, the entire full package; you are going to continue to be known for that. That is what we look for. Interviewer:	Can you give me a couple of examples of how a customer would have wasted money when left to their own devices, but you helped them really make a difference? Jeremy Ross:	Sure. Since we do direct mail or mailing services, as well as printing, there are a number of very specific things that you have to know about mailing services and US Postal Service requirements to qualify for reduced postage, which is everybody's reasoning for using a mail service. Sometimes all we are doing is providing mailing services for a client, in which case we will get brochures from the customer or shipped directly from a printing firm that they chose to use for that product. Due to regulations of the US Postal Service, which do change from time to time; if that company is not up on the regulations, even such a thing as having a travel brochure fold a specific way to where the orientation of the mailing panel is flipped the wrong way or it is not on the right panel of the brochure, it can cause the postal service to completely kick back the job from being mailed at a pre-sorted rate. If you have a direct mail piece for an event that's coming up in a couple weeks, you are already tight on time and you are sending out arbitrarily 10,000 pieces; you do not have time to reprint your brochure. Your pre-sorted standard postage which could have been 23 cents a piece, now it is 46 or 49 cents a piece. That could kill your budget. Can you imagine being a nonprofit organization that is tight on time? Instead of being 11 cents a piece for the postage at that point, which they would have qualified for, now the postal service says, "No, we are not taking your piece. You have to send it out first class at 49 cents a piece.” It could ruin an event. It could blow a budget out by thousands of dollars, and that is only because they didn't come to us up front and say, "Hey, I have to mail a piece. Would you check and make sure that this qualifies or if this is valid for mailing purposes?" Again, being able to go full-circle from the design side, and sometimes, knowing what the customer is going to use the job for, to be able to look at the end of the job and see how it relates to the design of the job, or the production of the job and how it folds, it is a great benefit to use somebody who has got all the experience to bear on knowing what could potentially be a problem. Interviewer:	That is a fantastic example. It almost makes me think of tax laws and how complicated they are. If you have got a business and you do not have somebody who is a sharp CPA, you can lose so much money from not having consultation that you can trust. Jeremy Ross:	There is a perfect example of that from nonprofits that are using reply envelopes. Quite often they are donation envelopes. If the donation envelope has any words, any verbiage, that talks about the donation being a tax-deductible donation or the person being able to deduct, and is not worded correctly for the US Postal Service, they can say, "Your mail does not qualify for nonprofit postage anymore." Now you have to mail it out at first class. It is a simple line that we have seen a thousand times before on nonprofit postage, "Your donation is tax-deductible" or whatever that specific is to the extent allowed by law. You're not allowed to do that anymore. Who knows that? We know that. Interviewer:	Can you give me a few examples of the kinds of questions you would ask a new customer who comes in with a random project to help them maximize their value and guide them? Jeremy Ross:	One of the things that comes to mind might be quantity. With our ability to produce a lot of the printing that we sell digitally now, it allows us to be more flexible on quantities that are more cost-effective. If people do not want to feel like they have to buy 3,000 or 5,000 of a brochure, if they feel like their usage on this because the information on the piece might expire at some point, you do not have to buy more just because you think you're saving more. You can buy 100 pieces and do a test market of it. For an example, there may be people who want to have variable information on it. Would that be okay value? Again, with our digital printing capabilities, you can be more flexible in the variable data information. Colors, how important are specific colors? When someone comes and says, "I want this PMS, this very specific Pantone Matching System number on my job," sometimes it is better to do a job digitally than it is to do off-set. We have the capabilities to do off-set printing and digital printing. Sometimes, depending on the specifications or the quantity or the size, many different factors go into the pricing out of a job. Specifically the color, they might say, "Well, I want to use PMS number 282." "Okay, that is a blue. Is that really critical for this piece to use PMS 282?" "I do not know. That is what the designer, or whoever, told me that our color is." 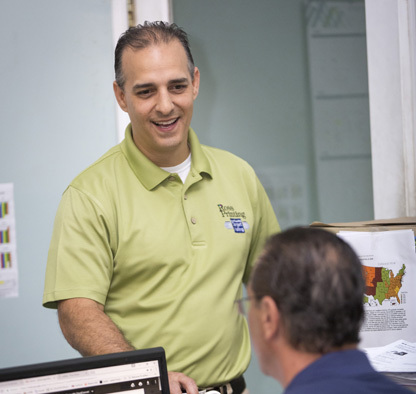 "Well, for your specifications, it will be a lot more cost effective to do your job digitally, which is a full-color build of that color, but it could be so much more cost effective than putting it on press just to use that specific PMS color. Is it really that critical that it absolutely matches that color, because there might be a slight bit of variance?" Quite often, the people will say, "Well, for that price difference, for that piece of printing, for that envelope or for that post card or whatever it is, the digital color is certainly close enough, and if it is saving me 30%, 40%, whatever the percentage is on it, it is considerably more value." On envelopes, there is the possibility of printing. We have multiple ways of producing envelopes. We have a digital ink deck. We have digital toner. We have off-set printing. Depending on the graphics of it, depending on the usage of it, why spend more on the carrier of a piece that is just going to be torn open and thrown away than you have to? Our ability to produce things several different ways gives us the strength to provide right-selling. Interviewer:	I remember that tour you gave me. You pointed out your philosophy of, "If we feel like there might be some jobs that requires a very distinctive, unusual machine that our competitors do not have, we will invest in it." Does that tie into that right-selling philosophy of helping the customer maximize their value in ways they would not have thought of on their own, to have such a broad array of different ways of doing a job? Jeremy Ross:	I think that lends to our ability to be competitive. Other printers that we compare ourselves to have the ability to print a full-color envelope, but they can only do it one way and we know that way is expensive. If we know that there are customers who want that type of a product out there or the ability to use that type of a product, and there is a better way to do it, and we feel like that is something that we could invest in and make available to a wider variety of clients, then we know we will be able to compete and gain more clients that way than having only one way to do something. Interviewer:	It really seems to lend itself to, "Well, here is the way you would not have thought of. You came in wanting to do the job this way, but because we have this type of equipment, it better suits your end result." Interviewer:	I really see you looking at the big picture more than I would expect in the role, which is fantastic. You look at the whole spectrum of what the customer is really trying to achieve with their business, as opposed to just taking an order. Jeremy Ross:	Yes, we are not order-takers. That does not lend to customer service, because if you allow a customer to make a mistake that you should know better on ... We're the experts. The customer is not the expert. We are the experts, so there is a great benefit to a client when you can be the expert and say, "I see what you are trying to get at, but we have experience that tells us that perhaps this would be a little bit better." Again, there are many different reasons that would give us the ability to guide the customer making the right purchase, as opposed to just something that they might spend money on anyway. Interviewer:	Of course, it makes you more competitive, but it really seems to also be coming from a place of empathy, where you care that somebody gets the most they can out of what you do. Jeremy Ross:	I always try to put myself in our customer's perspective, in addition to their customer's perspective. I would want to feel like I had been given the best possible information to make the best possible decision. I think that people feel it when someone just takes their order, and especially in the technical industry like we have, when you cannot possibly know all the things that we know. If you went to a doctor and you told the doctor, "I need this. I need this prescription," and they wrote you a prescription. For some people, that would be fine. Or some people would say, "I've got this diagnosis, doctor. I need this medicine." That would make me feel like the doctor is really not interested in finding out if in fact I have got something. "Is that what I really have? Is that what I really need?" Or the pharmacist does not look and see if you have any counter-indications with the other medication that you already have. That is another example of that. It is letting the expert do their job. Certain customers are adamant at getting what they want, and we do our best to appease them, not to the point of arguing, but we really do try to bring home that we know we are the experts. We really try to impart that to our customers, to let us do our job. Interviewer:	At least then, you feel good that even if the customer goes in a path that is really not in their best interest. You have presented an alternate path that can help more and say, "If you know that it is possible to get more value, more bang for your buck and all of these different advantages that we offer with this particular path I am recommending can do these things for you, and you choose not to do that; I can still feel good about that because at least I have made you aware of what is possible and the shame to me is if you did not take advantage of all these things because you simply were not aware of them." Jeremy Ross:	That happened. We do have clients who have all the money in the world to spend, and they see a certain value in a specific type of production. Again, going back to the digital capabilities, sometimes it is less expensive to do a job printed digitally than to print it off-set. If we have the ability to create a sample, sometimes we will even create a sample of a digital printed job just to say, "This is what you could get at this reduced cost." They can make the determination themselves whether they see the value in it or not, and they will make their own personal decision. I just know that I have done my job if I am bringing all of my experience and capabilities to bear to say, "There is not only one way to do this. There are multiple ways to do this, and you can make the decision." Interviewer:	I do not fully understand the difference between digital and off-set and have been thinking there is probably more people like me that would like to know. What are the differences? Jeremy Ross:	Traditional off-set printing is printing on presses. First, you have to have a person who knows how to run the presses. Normally that is a person who has been doing it for decades because it is a mechanical process. You are creating a plate that is processed and put onto a press that uses ink. Let us say we have a two-color press. You can do two colors at the same time on the job. It is a process of transferring wet ink onto a plate that is put onto the press that transfers the ink from the plate to the paper, which has a certain amount of drying time and has a certain amount of effect between the ink and the substrate. You can be very specific in the colors that you choose. You can hit that PMS 282, as I said before. It is like picking that crayon out of the box, and you are only using that. Not only that, why even have the capability of doing that? Well, certain jobs, based upon their quantity and based upon their specifications, it costs less. So we can be more competitive on those types of jobs. On the other side, digital is when you are taking somebody's file directly from the computer and you are running it directly to the machine: whether it is a color copy, or a black and white copy, or a laser printer, or an ink jet printer, or a wide format printer. It is printing directly to that machine. In those cases, if it is black and white, then it is obviously just one color. If it is color, whether you think you are just going to get red, it is still a mix of multiple colors that are being brought together to simulate the color that you are looking for. Most people will see that in full-color images and photographic images. Interviewer:	So, it could be ink jet or laser. You are just like, in a sense, bigger versions of the printers we would have in a home computer system? Jeremy Ross:	It is really exactly that. Our wide format ink jet printer has 12 inks in them, because it allows you for a wider array of blending and color accuracy and quality. Our digital presses use the exact same cyan, magenta, yellow, and black, four colors of ink that somebody on their desktop printers will use. The capabilities of them to print the size of paper, the thickness of the paper, the quality of the image consistently over and over and over again are what allows us to sell so much of that work because the quality is just so fantastic. It allows us to be competitive on that side of it. Interviewer:	Interesting. That really clarifies the difference for me. Interviewer:	Awesome. I think that is a lot of great information.